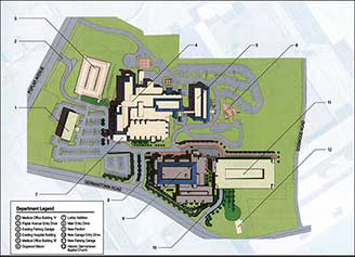 As a requirement to obtain construction financing and title insurance for a new expansion project, Methodist hospitals acquired the land surveying services of Allen&Hoshall, Inc. to perform and ALTA/ACSM Land Title Survey. Field data collection included boundary evidence, physical improvements and utility information. Title report Schedule II-B items were included on the final CAD drafted plat to delineate easements, rights-of-way, exceptions and encroachments.